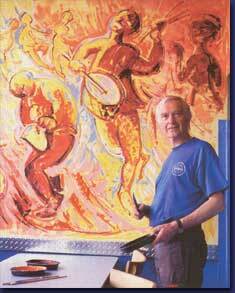 Sigmund Årseth was instrumental in bringing attention to Norwegian Rosemaling to America in the 1960's and his classes in Decorah, Iowa were an impetus to the Rosemaling movement in America. His classes and earlier book have inspired countless Rosemalers worldwide. His style of Telemark Rosemaling is unique and beautiful, vibrant with color and energy. Best known for his landscape paintings in his native Norway, Sigmund is renowned in the United States as a master Rosemaler. Sigmund Aarseth is concerned that Rosemaling not be just a "technique" of painting, but that it also keeps the Norwegian histrical ambiance and flavor. He feels it is important that traditional color and technique be true to their early roots. Sigmund uses this book to discuss bringing Rosemaling into the future -- whether in Norway or elsewhere in the world. Produced by Sigmund and his son, Gudmund, "Painted Rooms" presents an impressive variety of beautifully painted interiors, from colorful traditional Norwegian farmhouses to exciting commercial interiors. The book shows the innovation, experimentation and individuality which has always been an important part of the Norwegian psyche. It also documents a renewed demand for colorful, decorated rooms in Norway. The broad range of styles and techniques featured in this book makes it a valuable resource for anyone with an interest in interiors, decorative arts or Scandinavian lifestyles and t raditions. It is also an indispensable reference book for decorative artists, interior designers and crafts people of any discipline.